Or a Professor Layton game, or pretty much any idealized Japanese view of old Europe. And let me tell you, this place looks charming. This is Nukumori no Mori (ぬくもりの森) or "The Forest of Warmth." Located in Shizuoka Prefecture, it's a collection of shops and restaurants all done up in the same woodsy style. The village isn't actually connected with the animation studio, nor does it try to pass itself off as such. It's simply a shopping area for tourists. 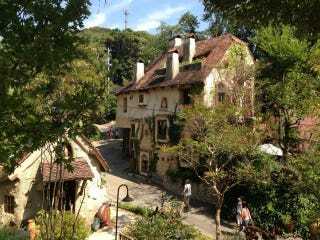 Granted, if you want to visit real Studio Ghibli spots in Japan, you can. There's the Princess Mononoke Forest, the house from Totoro, and, of course, the Ghibli Museum.